Somebody commented asking about making planes…so I thought it would be a decent idea to show how to go about making a Krenov smoother fo anybody who is interested in making a wooden handplane. There are some OK tutorials online, but most of them don’t really talk about what makes a plane good. If you want your plane to cut well there are a few things that are important to know when making your Krenov. In addition, I’m making a plane for a friend (probably from Ebony) – so I will be recording the whole process of making a smooth plane from start to finish. That way anyone who reads the tutorial should hopefully have the knowledge necessary to make a smooth plane completely (from start to finish) by the end of the tutorial. This will be a small smoother, with a 36 mm blade. I am hoping that the iron arrives later today so that I can get started this evening. I will begin posting the lesson as soon as I receive the iron. There are a number of views on how much it matters that guitar necks be quartersawn. Personally I would use quartered or flatsawn only, nothing with distinctly angled grain. However some say it doesn’t matter, as long as it’s stable. It came up in conversation, however, that often saw marks or end grain sealer at the lumber yard covers up the end grain of the wood, making it difficult to identify the grain direction while you are there. So I thought I would share this. This is widely known by acoustic builders, but I think electric guitar builders tend to pay less attention to the structure of wood to some degree. I wanted this to be posted here so that it gets archived along with the other tips and techniques…that way it’s here for anyone just getting started in guitar building to learn about. So here it is, a piece of basic lutherie knowledge that everyone should be aware of: How to identify quartersawn wood, without looking at the endgrain (or, a brief lesson in the anatomy of wood). It’s actually very simple. 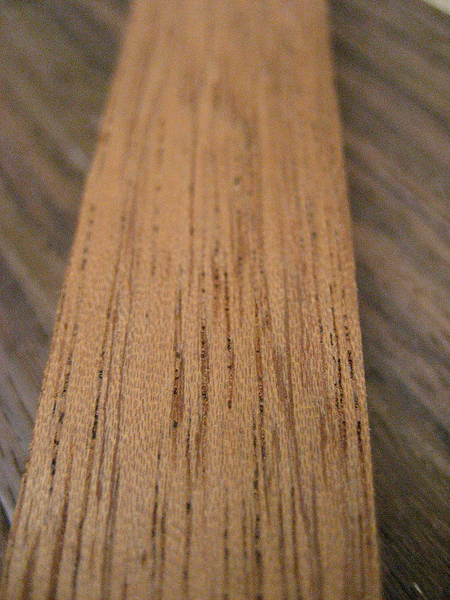 I must note that you’ll rarely come across wood that is perfectly quartered so as to display this in a regular lumber yard (unless they have wood marked as quartered, or a section for instrument woods), but if you bring a finger plane with you, you can find out the grain direction of rough sawn lumber quickly and easily by looking for this characteristic. In addition, in the opinion of many, this should be the standard by which you assess whether wood is considered quartersawn for the purposes of lutherie. 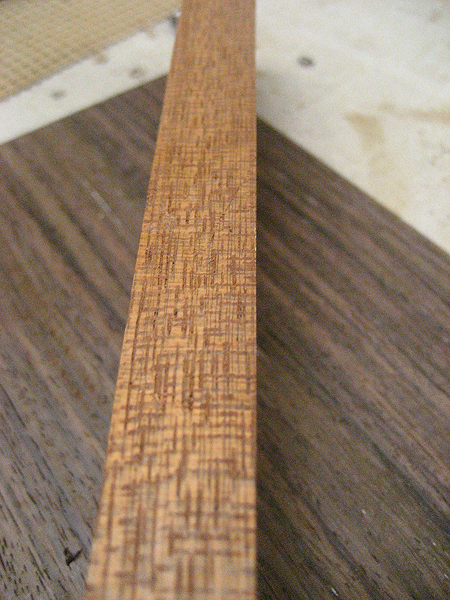 However, here is a piece from the same block of mahogany, but this piece is slightly off quarter. Notice that the medullary ray is not visible in this piece. This means it is not perfectly quartersawn. So, there you have it – the easy way to tell exactly which way the grain is running, without looking at the end grain. If you plane on the edge of a square block and the ray becomes visible, it’s rift sawn at about 45 degrees. If the ray is visible on the wide face, it’s quartersawn. If it’s visible on the narrow face, it’s flat sawn. I wanted to share this here…somebody posted it over on the MyLesPaul forum, and it’s insane. Everybody with an interest in hand tools (especially handplanes) should watch this! I have never seen anything like this before. In order to be able to continue to fund my guitar builds (which is getting very, very tight) I decided I needed to do something – so using the materials I had at hand, I decided to build some handplanes. This is the first of several planes I plan to make – it’s a Luthiers Plane (a.k.a. Violin Maker’s Plane, a.k.a. Miniature Handplane). This one has a bed angle of 55 degrees, so it should cut really nicely on figured woods. The throat is 3.5 mm, so it should be nice and tight once I get the blade in (that’s measured without the plane iron). This one has a flat base right now – I may curve it later if I decide to get a curved blade (going to pick up a blade from Lee Valley tomorrow). Blade width is 18 mm. It’s used for rounding guitar back and top braces and other misc. small jobs where a large plane won’t fit (more for acoustic than electric guitar building). Once this one is finished I’ll either sell it or trade it for some guitar hardware. I’m going to post an article on how to make these in the future. That’s all for now – cheers! I’m not normally one to go forth and suggest products, because everybody has a different opinion on what’s best. A room full of Luthiers can argue for days on end about what makes the best nut material, which woods sound to best, which pickups are the best for what guitars…and so on and so forth. However, I’ve been playing on a set of guitar tuners I purchased for over a year now, and I’m confident after a year of playing that these are the best tuners I’ve ever used. They come in a locking version. They’re open backed. They stay in tune. They also have an 18:1 gear ratio – more importantly, though, they are the smoothest turning tuners I’ve used. That’s the best part by far – I just purchased a set of 18:1 grovers, and I am disappointed by how poorly they compare with these tuners. I’ve had them on my Spanish Cedar J-11 for quite a while now and I can’t say enough good things about them. The tuning machines I’m talking about are Hipshot Grip-loc tuners (I have not tried the regular open back tuners). Surprisingly, this isn’t one of the names that comes to mind when you think about tuners. I’ve not talked to anybody about tuners and heard them say “hey, you know who makes really great guitar stuff? Hipshot.” I believe it’s because they’re known for making bass tuners, not guitar tuners. Actually almost all of their products are bass products. However, they’ve definitely carried over their knowledge well into these tuners. The only drawback is that they are more expensive than some of the other leading names (nothing near the price of Waverly tuners though), but you get what you pay for. I think I’ve gone on long enough about these tuners…so that’s all I’ll say. They don’t disappoint. On an unrelated note: My guitar projects have stalled due to the University exam period and Christmas holidays coming up. I haven’t posted here in a little while because it’s so hectic, but I will be writing some interesting pieces soon on various aspects of guitar building again once things settle down. So…what is it that makes a good handplane? I thought I would touch on it a bit – keep in mind though as you are reading this that I am definitely no expert. I’ve done quite a bit of reading and have some experience getting some very nice cuts on highly figured maple and going across the grain, but that’s about it. Anyways, though, this will be helpful to you if you haven’t heard this stuff before. A poorly made plane is hardly ever the problem – you don’t need a $250 Veritas plan to get nice, smooth cuts. It’s usually the set up. And to prove it, the one below cuts shavings almost as nicely as a Primus Reform smooth plane. I recommend building your own planes as the best way to learn about what makes a good plane function – google the krenov sandwich method in order to learn how to make a plane like this one. I have a better one in progress, but this is here for now as my latest project – a plane made from scraps. Scrap apple and cherry body, an old spokeshave blade from a broken Stanley spokeshave, and…could it be? Yep, a nail as the cross pin. Now that’s pretty boondocks. However, with a 57 degree blade angle, it cuts like a dream (except the nail bends and the blade loosens often; I’ll replace it with a steel rod soon though). Next project: A cherry wood plane with cocobolo sole, and a proper pin (not a nail!). Let the shavings below give you an idea of what a smooth plane made of scrap wood and nails is capable of when properly set up and sharpened. Your blade needs to be sharp – and I mean sharp. If you can’t shave with your blades, you won’t get nice cuts. If you can easily pare hairs off of your arm you’re in good shape. You should literally be able to shave with you blades. There are many good resources to teach you to sharpen online – if you can, check out the guide on the Hock website (google ‘Hock Blades’ for their website). Very comprehensive. If you can’t get waterstones, by the way, you can also get 3M papers from Stewart MacDonald used for polishing metals, etc. which you can use with the sandpaper method to get your blades up to snuff. The sole of your plane needs to be dead flat. Period. On metal plains, flattening is a huge pain. On wooden planes not so much. Either way though – warped soles mean poor cuts. The throat does not necessarily have to be tight – but it helps. 0.5-0.8 mm is a good width for a smooth plane. A tight throat increases the risk of shavings getting jammed in the plane, but reduces tearout. These are the big three. If you have a big problem getting nice cuts, there is a very good chance that one of these three things is not set up properly.